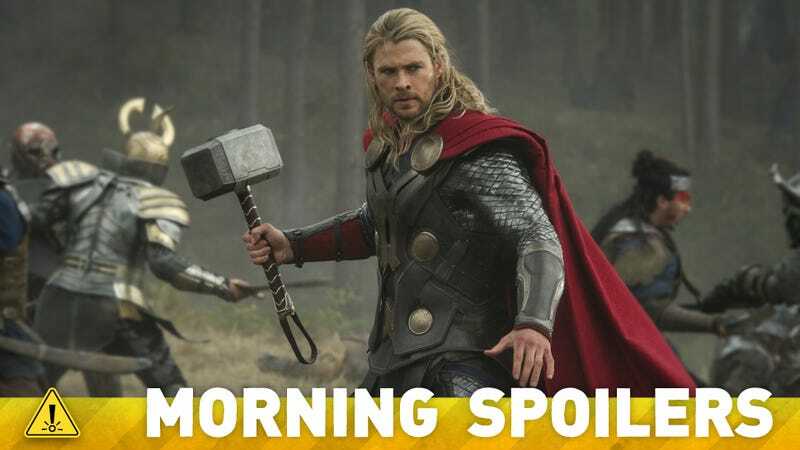 Does the choice of writers for Thor 3 mean we'll see Ragnarok? A Watchman star could have a key role in Batman Vs. Superman. Game of Thrones could be delving deep into A Dance With Dragons for one character. And did a non sequitur in the Coven finale actually hint to the plot of American Horror Story's next season? Plus, the Supernatural spinoff's character descriptions. Spoilers now! We've heard reports that Disney is throwing out large chunks of the continuity from the books and comics for its new movies. We've also heard that Luke Skywalker's wife Mara Jade could appear in the animated show Rebels and then cross over to Episode VII. Now there's another rumor, that has a very different spin. This time, unnamed sources claim that the characters in the new continuity will be based on the old Extended Universe characters, but with different names. Except Luke Skywalker's wife, who's reportedly been in George Lucas' mind since Return of the Jedi. Confusingly, the rumor claims that the Solo and Skywalker children and Luke's wife will be based pretty closely on their EU counterparts, as will a bunch of background characters. I am proud of Craig and have enjoyed working with him over these past years. His creative instincts have helped shape 'Thor' and 'Thor: The Dark World' at every level of the filmmaking process. The entire team at Marvel is very happy to continue collaborating with Craig as he continues as a screenwriter working with Christopher on the forthcoming chapter of Thor's adventure. Roy could possibly ruin a lot of relationships that the Arrow has built with a few characters, and he could also ruin a lot of relationships that he's built for himself. I'll tell you this. The name Deathstroke will be uttered soon, but the first time it happens it will not be uttered by Stephen. I will say that we have a crazy number of DC – it's funny, there's stuff that will be happening in the middle of this season that we haven't announced yet, that if people think we've done a lot of DC Universe stuff now it pales in comparison to where we're headed. It's really going to be kicked up to a ridiculous degree. There's two episodes in a row, where we're keeping the titles secret, because both episodes will just blow people's minds. We have some romance coming up, we've had a little bit in season 2. It wasn't romance per se that we were trying to steer away from, it was the way we were doing romance. I think if you look at all the "romantic" storylines last year, we sort of felt like they were siloed off from the main action of the episodes. Whenever we went to a "Thea and Roy" or "Laurel and Tommy," their romantic storylines felt separated out from everything else that was going on in the episode with the Arrow and everything else. One of our big goals in season 2 was to avoid those sort of separated off storylines. The result is that maybe we haven't had quite as much romance, but each episode has been better for not feeling so schizophrenic. It's been better for not feeling like we were suddenly a different show when we got to the C story. But for people that are fans of romance on the show, there is quite a bit of romance coming their way. The difference between this year and last year is that the romance will be integrated into the body of the series. Now it's all gloves off and he's going to go out to get [Sarah]. He feels like he's been betrayed and the dark side of Ivo will come to the fore now. . . . This is a big, big, culmination of where Ivo's been going all season. It sets Slade on his future journey and his relationship with Oliver. Really, it's really a big, big moment for the show in general. I mean, if someone knocked on your door wearing leather and guyliner and tried to kiss you…? He's lucky he didn't get a baseball bat to the head! Emma's a tough cookie when she has her memories. So without them, it's not going to an easy road for him. Here's a sneak peek at episode 4.4, "Panic Womb." Here's a sneak peek of episode 4.4, "Turn to Stone," in which "Bo confronts a dangerous foe and makes a shocking discovery, while a confession from Kenzi could change her relationship with Bo forever." And here's a behind-the-scenes interview with Vex and Trick. Here's a sneak peek at episode from episode 4, "Grief." ENNIS ROTH | The de-facto star of the potential series, Ennis is "likeable, strong-willed, resolute, with a strong sense of justice." He's the son of a cop who grew up in poverty. He's en route to the police academy himself when someone he is close to is murdered — presumably by some kind of monster. He meets up with Sam and Dean and "learns the staggering truth" that Chicago is run by five families of monsters (including, but perhaps not limited to, werewolves and shape shifters). And with that, a new monster-hunter is born. Fun fact: Producers are looking to fill this role with an African-American actor in his early 20s. DAVID HAYDEN | A shape-shifter from one of Chicago's ruling monster families. He's been living as a human for some time, but a tragedy propels him back into the life. David is in his early 20s. MARGO HAYDEN | David's "professional, strong-willed, determined, ambitious" shape-shifter sister. She's an "ex-punk rocker gone corporate" who sets out to be the new head of the family in the wake of a tragedy. Margo is in her early 20s. VIOLET DURANT | A werewolf and part of the wealthy, powerful Durant family. In a twist right out of West Side Story, the early-twentysomething is hot for family rival David (see above), but their love is forbidden. JULIAN DURANT | Violet's "savagely handsome, strong, arrogant" twentysomething brother and Ennis' arch nemesis. FREDDIE COSTA | A world-weary copy in his 30s, Freddie has a soft spot in his heart for Ennis (he knew his dad back in the day). Fun fact: Eddie's got a secret.